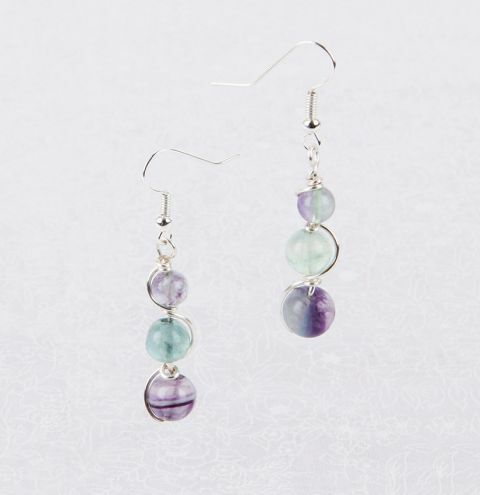 Create a pair of delicate wire wrapped earrings using pretty fluorite gemstone beads. Cut a length of wire measuring approx 8" or long enough for you to comfortably work with. Bend your wire to a right angle approx 2" from one end. Thread an 8mm bead onto this shorter side of wire. Your wire wrapping may take some time and will need to be held firmly as the bead will spin around on the wire. Hold your bead firmly down at the base of the wire on the right angle. Curve the longer side of wire upwards and to the right around the front of the bead. Keep the wire tightly to the bead and wrap twice, tightly around the wire above the bead. Thread a second 8mm bead onto the wire above your wire wrapping and repeat this step, curving the wire around the bead in the opposite direction. Make two wire wraps around the wire above the bead. Thread a smaller 6mm bead onto the wire above your wire wrapping and repeat the last step, curving the wire around the bead in the opposite direction to the last time. This should be in the same direction and your first wrap. You can now finish both ends of wire in neat loops at the top of your earring. Trim the wires down to just under 1cm. Turn a neat loop with both wires. Open the loop on your ear wire and attach to the loop on your wire earring charm. Close the ear wire loop. Repeat these steps for your second earring.